We conduct our research using a variety of age-appropriate study methods, asking how infants, toddlers, preschoolers, and adults mentally represent, reason about, and respond to people and different sorts of social events. Often, a single study session may combine multiple methods of investigation. You can learn more about our study methods here; for more information on our research questions, please see our Research Topics page. For many studies, the parent will sit in the same room where the study is conducted, either with the child or off to the side. However, for some research questions, having a parent present might influence children’s responses. In these cases, we offer a live video feed of the study session, viewable in the nearby waiting area. One of the best ways to study the cognitive abilities of very young children is to measure how they look at different people, objects, scenes, and events. Studies of infants’ visual preferences – for instance, choosing to look toward a friendly versus unfriendly person – can reveal much about the distinctions that they find important. Infants’ looking behavior also provides a powerful insight into their expectations for how the world should unfold: Just like adults, even preverbal infants will look longer at events that they find unusual, novel, or surprising. By comparing infants’ responses to scenes with expected versus unexpected outcomes (typically presented on video or on a puppet stage), we can draw conclusions about how they understand the events that those scenes portray. For many of our looking time studies, we record an infant’s looking behavior on a video camera, so that a researcher can review her responses for each portion of the study. However, some studies require higher temporal or spatial precision in our measurements. For these, we use an eye-tracker to monitor a participant’s eye movements more closely. From the participant’s view, the eye-tracker is a small box below a regular computer monitor – but this box contains a specialized video camera, closely integrated with a computer system designed to rapidly pinpoint the direction of a participant’s eye gaze. Using the eye-tracker, we can analyze subtle gaze patterns, such as where exactly the participant looked on the screen at different points during the presentation, how quickly she responded to different events, and how long she spent looking in different locations. 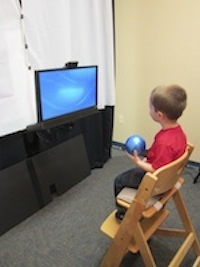 We also use the eye-tracker for many of our studies with toddlers, preschoolers, and even adults. The basic principles of how people look – for example, in locations where more interesting things happen or in sequences that provide the most useful flow of information – are continuous over the lifespan. Consequently, comparisons of eye gaze behavior between participants at different ages can provide a valuable window into how different aspects of social understanding develop. 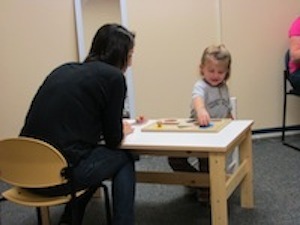 In other studies, we take a more hands-on approach to measuring children’s social understanding and social motivations. Studies where children engage with a researcher in structured interactions are a valuable complement to the eye gaze measurements described in the previous section, revealing how children deploy the conceptual understanding suggested by more sensitive investigative tools. For instance, we might observe whether or when a child follows a researcher’s gaze direction, provides information that is relevant to her, or helps her achieve a goal. Because these demonstrations of the child’s social understanding are grounded in real social interactions, they also shed light on the motivations that drive different social behaviors – addressing issues such as why children respond so strongly to opportunities to share attention with, to communicate with, and to help others. These active behavioral observations are structured as games or play sessions; often, the children don’t even realize that they are in a research study! The researchers will typically begin the session with a “warm-up” play phase to help the child feel comfortable with them and the testing environment, before moving into the actual study. At key moments, a researcher will say or do something according to a previously written script, to see how the child responds. There may be a single or multiple researchers involved (and there might even be puppets).